Prices shown are already discounted rates for Spring Break Open Weeks. Just completely repainted top to bottom & all new stainless steel appliances! Low 3rd Floor 3 BR 3 BA condo Sleeps 12 in beds - King Bed in Master Suite, Queen Bed and set of twin bunk beds in 2nd BR, 2 Queen Beds in 3rd bedroom, and a Queen Size commercial grade sofa sleeper- Great for Large Groups Multiple Families. Pets considered depending on the pet – Send Email. Dogs MUST be registered service dogs to be allowed on the Tidewater property..
Tidewater is one of the newest resorts on Panama City Beach. A great family resort lots for kids and adults to do on property and nearby..
Great Amenities! Tidewater features 636 feet of gulf frontage, a large Gulf Front fitness center with full cardio equipment, spas, saunas, steam rooms and health bar, 3 pools 1 is indoor 2 outdoor 4200 Sq. Ft. lagoon pools, Poolside Tiki bar, an indoor heated pool, movie theater on site, Tiki Bar by east pool, Bar and Restaurant on first floor, Free WIFI in unit, grilling areas on site. Decorated with a tropic look, Large rooms and terrific Ocean views. 9 foot ceilings, all tile floors, granite kitchen counter tops. Living Room commercial grade Queen sleeper sofa is comfortable, 3 theater style recliners with built in cup holders to watch sports or a movie. 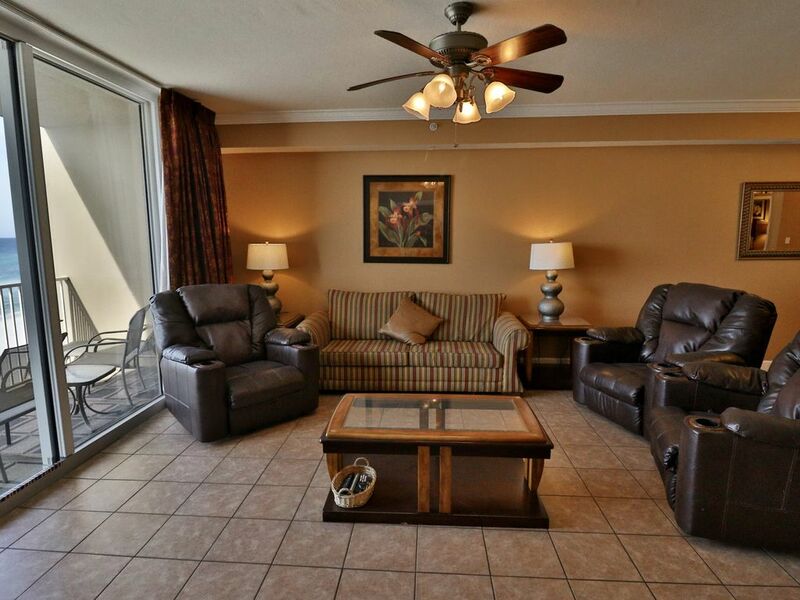 Large Flat Screen TV and DVD player, Tropical artwork & accessories complete the look of our condo. Large master bedroom suite panoramic bay window overlooking the Gulf waters, en-suite bath, separate shower and garden tub, & balcony access. King bed comfortable mattress to lay back and relax. Flat Screen TV. and a huge walk in closet room for all your personal belongings. Sliding glass door open to the balcony & direct ocean view. The bay window has roll up shades so nothing comes between you and the breathtaking vistas. 2nd BEDROOM Queen bed, set of Twin Size Bunk Beds & attached full bath. Flat Screen TV. 3rd BEDROOM 2 Queen beds & Flat Screen TV next to hallway bathroom , full size washer/dryer in the laundry closet. KITCHEN has granite counters white cabinets and ALL NEW stainless steel appliances. The price you have to pay for this unit is way to high with this furniture. We have never stayed in any condo with furnishings this bad. Seems like everything you touch was broken or it would break. I have been carry my immediate family on vacations for about 8 years ( 10 people). This is what you would find in a cheap motel. Even some of the floor tile was loose. Tidewater is a great place to stay, with great parking access. Just don’t stay in this condo. BEWARE YOU HAVE BEEN WARNED!!!!!!! Please see the previous 3 reviews who did not share this opinion about this condo. We actually do not recognize this person (Chris M.) and believe it must have been written on the wrong listing. This condo was just totally repainted top to bottom in 2018. There is no broken furniture in this condo. It has 3 great theater style recliners for watching movies and sports and a sofa sleeper which admittedly they never are the best seating. The condo is very nice. We had everything we needed, although we didn't cook, so I can't speak to the cooking utensils. The elevators are so slow that they are almost useless. This made getting to and from the car with our stuff a big headache. The stairs are right next to the condo so that helped. The resort is oddly laid out so you have to use two different sets of stairs to access the pool and beach from your room. You walk down to level 1 on the stairs by the room, then down the corridor to the main staircase to get to the pool and beach level. Since the condo is only on the 3rd floor this is ok, but it is inconvenient. It is Still MUCH better than having to rely on the elevators. They have 7 elevators for 30 floors and 500 units. Just forget that as an option. Over all I would give the Condo intself 5 starts. But the beds in the third bedroom are full, not queen, so keep that in mind. The resort it's self I would give 2 stars because of the poor layout and the long wait for the elevator. Security was top notch, so they kept the family atmosphere all hours of the day and night. If you are looking for a crowded high rise with nice room accommodations, then this is the place for you. Thank you Jamie for your 4 star review. We appreciate your comment that we were very helpful and the condo was spotless and “Over all I would give the Condo itself 5 starts.” and “Overall, I recommend this vacation rental.” The elevators are actually very fast the problem is that people hold them until all members of their party get out of their condos and on the elevators together. But as you mentioned being on the 3rd floor makes any issues with elevators a moot point. Thanks again, it was our pleasure having you as our guests so please do come back again! The property was very nice. Had a Great Time. Had an Awesome time. Our boys experience an uncomfortable experience at the pool by an Adult male that is an owner of a condo on the property. We reported the incident and they said they had complaints before about this male owner. Our boys are very intelligent young men that were enjoying their spring break. Racial profiling does exist and when it happens to your children it is soo disappointing. Just making you aware of that issue, but we didn't allow that one issue to ruin a Great Spring Break for Our Family. Hi Pamela thank you for your 5 stars review. We are very happy that you had a nice vacation. We followed up on this issue with management and that person has been warned to not repeat that behavior. Thanks Tori for your 5 star review! We are happy that you enjoyed your stay. Your description of the condo does do it justice and we thank you for that narrative. Yes you certainly did ask a lot of questions with multiple emails lol. We answered all of them either with a direct answer or asked you to print and refer to the 2 emails we had already sent to you with your check in instructions and the special instructions for spring break. Those emails had answers to almost every question including what "starter supplies" of dishwasher detergent would be the condo for you when you checked in and supplies for the rest of the week were your responsibility Apparently, being first timers in the condo rental experience, you thought this was like renting a hotel room with daily replenishment of supplies. . The condo is big and it will sleep at least 10. It was, however, in very poor condition and received minimal maintenance. First, we worked for hours cleaning the entire condo. There was sand, grime, and dirt everwhere. We found mold in a shower stall and what looked like feces on a toilet. So many lights were out, we bought and replaced several bulbs. In addition, the sofa was worn and disgusting. I didn't sit on it during the month of our stay. Most of the furniture was very old and damaged. There were missing switch plates, wobbly bedposts, cracked or loose tiles, and inoperative recliner mechanisms. Most of the dresser drawers were missing knobs. Several of the dining room chair legs were broken and we had to label them "kids only", to ensure that no adult used them. The kitchen pots and pans were barely usable, and were too small to use for feeding more than a few occupants at a time. We've rented many VRBO's, and this was by far the worst. Especially considering the price, without a major remodel, I'd pass on this one. This condo was just totally repainted top to bottom in January 2018 right before these guests arrived. The review fails to mention that we correct these issues for them. There was 1 missing outlet cover behind the curtain in the living room that did not get replaced after the painting was completed. There are no dining room chair legs broken. Our maintenance man went there after the guests arrived replaced the outlet cover and tightened the allen head screws on 2 dining room chair legs. There were 2 knobs missing on one dresser our maintenance man replaced both of them. Bed posts needed to be tightened by our maintenance man after children had been playing on them. We brought theses guests a new set of pots and pans. Had a great vacation here at Tide Water Beach Resort! Would definitely come back here next time we want to come to PCB!! Thank you Debra for your nice comments please come back again!